RIVERSIDE -- Contested on the same course that will host the CIF-Southern Section Prelims and Finals, the Riverside Invitational gave some of the section's best an opportunity for a test run of sorts on the Riverside Championships XC Course! In the Large Schools' Varsity Girls race, highly touted Vista Murrieta's girls put their talent on full display, highlighted by a dominant performance from freshman Devyn Candaele. Staying up front with Santa Ana junior Maria Hernandez until a half mile to go, Candaele (17:24.2) accelerated to the 16-second victory over that short span. Her fellow Broncos ran their best race of the season with Emily Bourque (17:54.3), Aniya Pretlow (18:06.7), Peyton Candaele (18:11.7) and Paige Haynes (18:21.8) cementing the 23-point victory over a very talented Fountain Valley team. The Broncos placed four in the top nine, including Haynes, running just her second race as she works her back into the mix after after a late start to the season. Meanwhile, Fountain Valley was led by Ashley Faller (17:44.2) and Sara Feitz (17:57.5). Fountain Valley bounced back well from a frustrating finish at last weekend's Orange County Championships as Maddie Jahshan broke onto the score card as their No. 3 scorer today with an 18:21.2 effort. Beckman's girls continue to improve and were led by Jocelyn Hill's 18:02.7, 7th place finish. Featuring three freshman scoring right behind Hill, they held off Dana Hills, Tesoro, and Woodbridge. Riverside King's boys continue to improve with a slight upset over Woodbridge and Trabuco Hills. King's lone senior in their lineup, Garrett Vasta, moved up well over the last mile to pace his group that all scored within a tight 23-second span! We had King ranked around 15th in the preseason, feeling that perhaps the Wolves were still one year away from being a state meet team, but they are now knocking on that door. King outlasted a strong Woodbridge squad for a 93-96 victory while Trabuco Hills was not too far behind with 106 points. A great individual battle between Trabuco Hills' Josh O'Neill and Aliso Niguel's Ben McKenna ensued as both shadowed one another past the two mile mark. Over the last 600 meters, McKenna moved ahead for a convincing victory with the fastest time of the day of 14:57.1. California High took fourth, just two points ahead of Tesoro. In the Medium Schools' Division, Westlake brought home a convincing 42-point victory over Newbury Park. Both ranked right near one another, yet trying to break into that top seven in the Division II hierarchy, Westlake's Rebecca Schultz led the way with her 5th place, 17:51.4 performance. Simi Valley-transfer, Hailey Golman made an impact with her 18:51.6 effort, as Westlake was able to counter the front-running duo from Newbury Park in Archana Mohandas (17:45.1) and Fiona Hawkins (17:51.4). While Corona del Mar sophomore Annabelle Boudreau impressed with her 17:28.0 effort, it was the sophomore from nearby J.W. North, Makayla Browne, who rolled to the fastest time of the day in 17:19.1! In the Boys' Varsity race, Foothill continues to prove that they can be a top ten team at next month's Division II Finals as they held on for the 11-point victory over Corona del Mar. While Jeremiah Rasmussen of Hart ran to a dominating 15:13.2 victory, Foothill was paced by Caden Sanchez' 15:43.5, sixth-place effort. With a 42-second scoring spread, Foothill's top four all finished 20 seconds apart. While Murrieta Valley finished in third place as a team, Newbury Park allowed their top boys to train this weekend while their 'B' team took fourth. In the Small Schools' Division, Laguna Hills has been off the radar thus far, but came out here with their strong, 30-point victory over Flintridge-Sacred Heart. The defending Div. III champs on this same course last year, Claire Selleck (18:32.8) and Lauren Turner (18:47.4) led the way with their 2nd and 3rd place finishes. 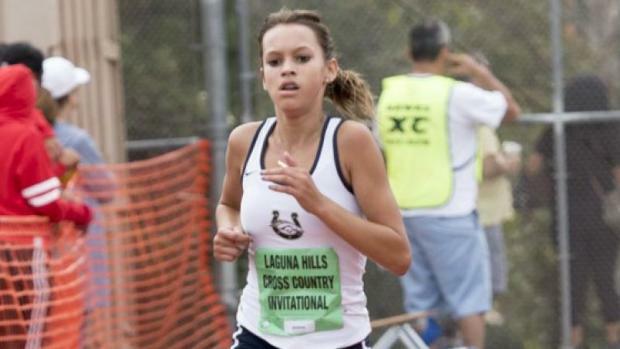 Costa Mesa's Diane Molina, who shined last month at the Laguna Hills Invite, cruised to an easy victory at 17:59.5. She was a State Meet qualifier as an individual a year ago. On the boys' side, Ocean View was able to leapfrog Cathedral on that fifth runner as Jason St. Pierre brought home a fourth-place finish (16:09.2). Cathedral is the defending divisional and state champions for Div. IV but not all gears were clicking as well here. Ocean View, moving into Division IV this season, earned the title here with a slim, 85-90 margin of victory. Devin and Dillon Hightower took 1st and 2nd with Devin crossing the line at 15:50.3!